I can still see my older daughter, who's now 7, when her little sister first arrived. Paige, who was 2 1/2 at the time, couldn't wait for her new sibling. She helped set up her room and got a new doll to play "mommy" with. In the hospital, the sisters exchanged gifts, and Paige doted on the baby. For a while, she even believed all that business of how wonderful being a big sister was. Then the novelty wore off. A week after her sister was born, Paige said that we should take Marissa back to the hospital. When that idea didn't fly, she suggested that we give her sister to a family who didn't have a baby. One heartbreaking day, while I was holding Marissa, Paige threw herself down on the floor and sobbed: "She hurts my feelings." Ah, siblings. In spite of parents' best efforts, having a second child is tough on a firstborn who, until No. 2 came along, had a monopoly on mom and dad's laps, love and attention. "There isn't any way to avoid the rivalry," says T. Berry Brazelton, M.D., pediatrician. "It's natural and healthy. The best you can do is help the child adjust and keep in mind there's probably no better gift you can give a child than a sibling." Helping the first child adjust While no parent can avoid or predict her child's reaction to a new baby — which can show up as regression, aggression or withdrawal — you can help smooth the transition during pregnancy and after the birth, according to Vicki Lansky, author of Welcoming Your Second Baby (Book Peddlers, 1990). Here are some of her tips. Invite your older child to help set up the nursery. Let your older child adjust to a new bed several months before assembling the crib again for the newborn. Enroll your child in classes for older siblings. Buy your older child — boy or girl — a doll that he or she can "nurture" as you care for your baby. At the hospital, get a heads-up from your husband or nurse; don't be caught holding your newborn when your older child visits. Have both arms ready to greet her. Have a gift for the baby to give his big brother or sister. A gift from the older child for the baby is also nice. Set aside one-on-one time with your older child away from the baby. Try to make these dates at least weekly. When someone comes with a gift for the new baby, let the older child open it. Even better, have a stash of small wrapped gifts for her to open when the baby gets a gift. Acknowledge your older child's negative feelings. Don't tell her that it's wrong to feel jealous or angry with the baby. Discuss her feelings instead. For example, say, "You're feeling left out, aren't you?" Or, "It's hard to suddenly have to share your mom with another child, isn't it?" Be sure your older child knows the baby isn't taking love away from her, but only adding more love to the family. Healthy regression Some parents, while trying to make the older child feel better, can make matters worse, says Jackie Rosenberg, a Sherman Oaks, Calif., child-development specialist who has been teaching baby classes to new and second-time moms since 1982. The most common mistake is to emphasize how "big" the older child is. "With all the fuss and talk about the baby, older kids are quick to figure that being big is not such a great deal," she says. "That's when they go back to bottles, diapers and baby talk." Rosenberg says that you can minimize regression by downplaying the big and little. For example, instead of your saying, "Johnny is so lucky to have a big sister like you," just say "a sister like you." And know that while regression can be frustrating, it is normal. Most child-care experts advise letting the child slide until she feels secure enough to grow up again. 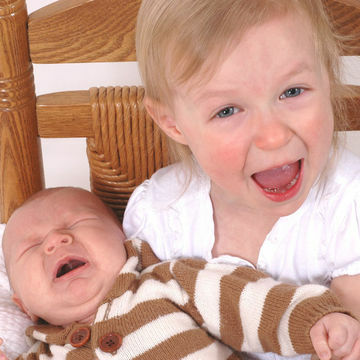 Your older child's age and temperament also have a lot to do with her reaction. While my older daughter was more verbal and, well, theatrical, other children may act out their resentment physically. When Katie Shreve of Laguna Niguel, Calif., brought her daughter Kendra home to big brother Donovan, who was a little over 2, the first month went well, but then he protested. "Whenever I would start to nurse," Shreve says, "he would ram himself into us or stand on the back of the couch and jump on us." And if she leaned over while holding the baby in a front carrier, her son would grab the baby's hair and pull it. "For a while, I couldn't leave them alone together, but eventually she won him over," she says. Spacing pros and cons Notions of ideal birth spacing between children vary, and nature doesn't always cooperate. While a firstborn under the age of 2 won't be old enough to realize what he's missing when a sibling arrives, most experts advise putting two or more years between children, with three years being ideal. "It's always easier if they're at least two years apart," Brazelton says. "Any closer, and it's almost impossible not to push the older child to grow up too soon." If the siblings are more than four years apart, they're less likely to be friends, says Lansky. But parents get more of a breather between babies, and paying for college may be easier because payments are spread out. Besides spacing and the impact on an older child, parents contemplating another child should consider energy, space and costs. Many new moms, who know how much time and energy one child requires, rightly worry how they will ever manage two. "No mother ever felt she had given enough," Brazelton says as consolation. "It's so easy to make these little people and so hard to live up to all their needs later in life."